United Parcel Service (UPS) for larger shipments, including all track shipments, where shipping exceeds $6. The packages shipped via USPS can take anywhere from 2-9 days per the USPS guidelines, but we find most customers receive their purchases in 3-5 business days. Tracking numbers are not provided on these shipments. We leverage the USPS for these type packages as they offer the most economical option for our customers. Packages shipped via UPS Ground service typically arrive in 2-5 business days, depending on location. UPS does not guarantee a service level on Ground service. If a customer requires that a package is delivered by a specific date, they should select either the Next Day or 2nd Day shipping options. These orders must be placed by 2 pm central time on weekdays to assure they ship that same day. Tracking numbers are provided by email upon shipment, and can be tracked at UPS.com. 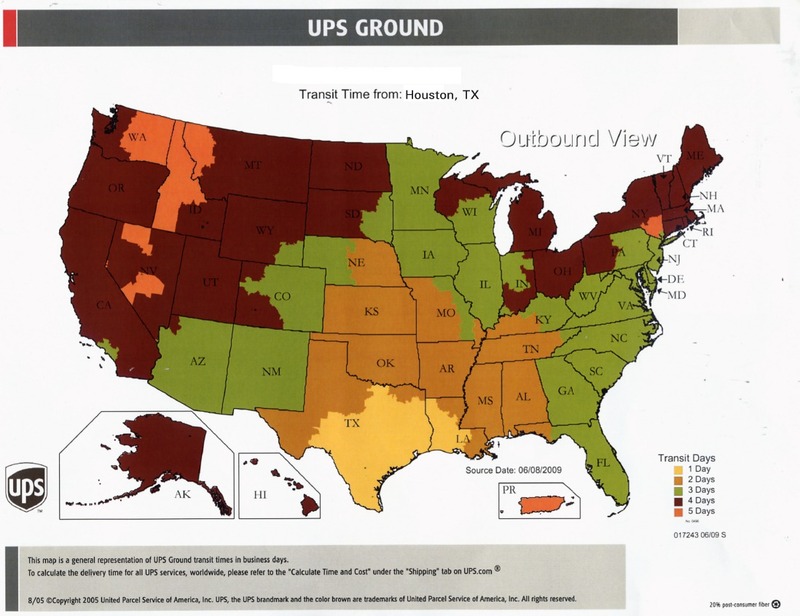 For your reference, we have provided a map below depicting UPS Ground Transit time guidelines for shipments from Curtain-Tracks.com. It bears repeating that these are not guaranteed service levels, but are typical of the time UPS requires to deliver orders to specific geographic regions.